Domain industry messaging circa 1996-1998. 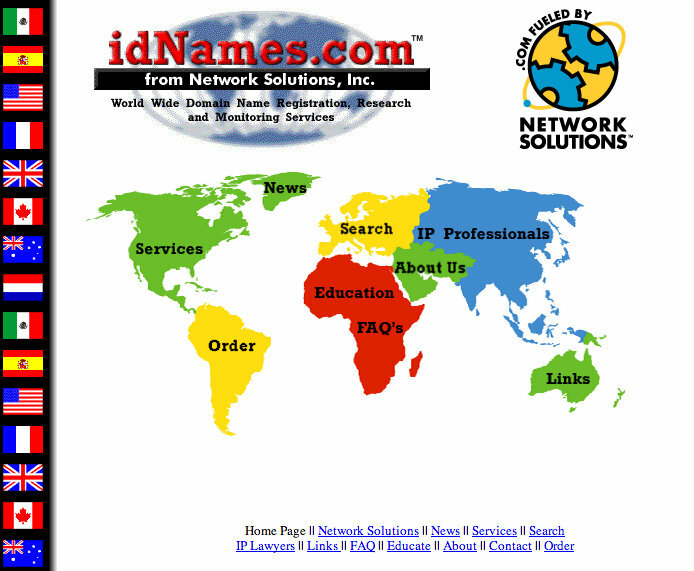 Over the weekend I visited the fabulous Wayback Machine to see if I could find screen shots of the website we created in the 90’s for Internet Domain Names Inc. (idNames.com). That was the first domain name business I got involved with as a co-founder with Marc Ostrofsky. I got a chuckle looking back at how we designed that site, but also just looking at the messaging and how much of it still holds true today to some extent. One thing that has changed is pricing…it’s definitely gone lower. We were charging roughly $250 per new registration in each unrestricted ccTLD back then. Restricted ccTLD registrations started at $450. If you’d like to see more screen shots of how we were messaging and selling domain name registration services in 1998, or just want a laugh, please go to my new FaceBook page I’ve set up for my consultancy and you can view pics there. And while you’re visiting please be sure to ‘like’ my new page! Thanks.